The basic principles of content marketing are quite simple and you don’t need a magic formula to achieve success. Having said that, it doesn’t hurt to introduce a bit of scientific experimentation every now and again to see what works and what doesn’t. If you have some engaging and interesting copy or visually striking and compelling images, you’re already halfway there. But the written word can be chopped, changed and edited to suit a specific style or target a certain audience, so what about images? This is where A/B testing comes in – a fairly common term in web development and online marketing, which can also be used to examine and analyse the effectiveness of images. A/B testing is an incredibly useful and very effective way to make measurable improvements to any content marketing campaign. However, it sometimes does not get the attention it deserves, as numerous marketers focus their attention on other techniques such as SEO and analytics. For A/B testing, all you do is compare two versions of an element, in this case an image, to find out which is most valuable and successful based on a set of metrics. For example, when sharing two images on social media, the one with the most likes or retweets would be the winner. However, to ensure fairness and consistency, it is recommended that both versions of the element be tested simultaneously. As the test progresses, you may want to make regular notes about how each version is faring. There are various different ways to carry out an A/B Test, but Google’s Website Optimizer is a great tool for analysing two images to see which one is the best. In fact, you can test up to 10 variations of a landing page featuring numerous different images using this method. With these content experiments, it is possible to compare how different images perform using a random sample of visitors. You can also define what percentage of visitors is included and receive updates on how each image performs. 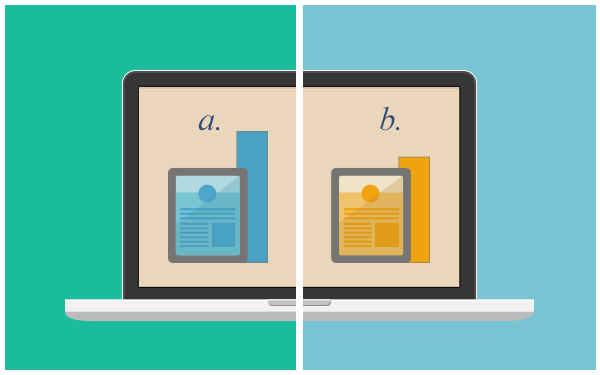 A simple A/B test can be set up in two ways. The first is to create two versions of an image and upload these to the Google Website Optimizer. When your test goes live, Google will select one of the two images before displaying it to the visitor. Alternatively, you can create a new page on your website featuring one image and a variation located at a similar address with the other image. Google will redirect some visitors to the alternate URL when the test goes live. For every test, you’re going to need some sort of conversion goal, which can be as simple as clicking on an image that links to another page. Once the visitor has clicked this link, Google will record which variation was shown and over a period time, you can check the results. On the other hand, you could use two alternative email newsletters or social media posts to carry out an A/B test, which is exactly what they did over at Hubspot. Out of 36 scheduled tweets over the course of a week, links to 18 different blog posts, eBooks and templates used simply a title, while the others included an image. The tweets with an attached image resulted in a 55 per cent increase in leads. Using this methodology, you could schedule something similar by using two different images instead. While A/B testing can be quite simple and straightforward, there are several considerations you should bear in mind at all times. Here are some of the main points, which can also be found in more detail on this great guide by Smashing Magazine. Try to test simultaneously. If you wait to test the variation after the control, this doesn’t give a fair indication of what the most effective image is, as you might strike it lucky one week compared to the next. Have a time limit in mind. Conclude too early and you might not receive meaningful results, finish too late and poor performing variations could cost you in conversions. Thankfully, you can use an online calculator to determine how long to run a test for. Be consistent. If an image appears in multiple locations on your site, make certain that a variation is seen everywhere. Ensure you show repeat visitors the same variations too and don’t surprise regular customers. Test often. In order to optimise image conversion rates, make sure you carry out several A/B tests. You could get lots of negative results, but positive outcomes will undoubtedly result in future prosperity and success. Stick with the results. Even if you prefer the aesthetics or design of a certain content marketing image, it might not prove to be the most successful. Always choose the image that delivers a better conversion rate, as that is your primary goal. It might not be possible to implement all of these suggestions in every A/B test, but they are bound to deliver the most consistent, accurate and reliable results. From call to actions and product descriptions to promotional offers and content marketing images, there have been various examples of successful A/B testing. You can check out numerous different tests on this Copy Hackers post, but here are some of our favourites. Team Romney – Although Mitt Romney’s 2011-12 presidential campaign wasn’t successful, one aspect of his digital footprint resulted in huge gains. By simply moving the email sign-up field to the hero banner, the campaign received a 632 per cent spike in leads. When you consider that each new email address was worth nearly $8 in donations or revenue, this was a significant success story of A/B testing. RunKeeper – Despite this fitness activity app’s name, RunKeeper can track all manner of physical exercises, from cycling and hiking to skiing and yoga. Using A/B testing, the developer modified its UI and as a result, users tracked 235 per cent more non-running activities. When you look at both versions side by side, you can see how effective A/B testing could be for content marketing purposes. Mall.cz – This popular European ecommerce retailer found that simply increasing the size of their product images and making a description viewable on mouse over, sales increased by almost 10 per cent. Only minor alterations were required with no additional advertising. This example just goes to show how powerful images are, the simple nature of A/B testing and the positive outcomes that can come from implementing results. While you might not pay as much attention towards A/B testing as say SEO or analytics, it can be an incredibly useful and beneficial tool for content marketing purposes, especially when it comes to images. Creating an A/B test for images does not have to be a difficult undertaking and can integrate with current marketing activities. From coming up with some new landing pages to modifying social media output, trying-out different images and analysing the results is fairly straightforward thanks to various tools. There are certain factors and practices you should consider at all times in order to get reliable and accurate results. But more often that not, you will see a notable difference in the performance of two distinctive images. And from looking at some of the success stories of A/B testing, it is clear that this is a worthwhile technique for any content marketing campaign. It may take some time to find the right image or content, but all that work has the potential to transform or even revolutionise the simplest activity. Image credit (top), image credit (1), image credit (2).